This week we are celebrating the 50th. anniversary of the release of She Loves You in Canada. This was the Beatles fourth single in Canada in 1963 and it was the first single to break the group nationally. Paul White's gamble finally paid off. She Loves You was a great track and I'll Get You was a great flip side too. The Beatles released a total of five singles on Capitol in Canada during 1963, and for many Canadian Beatles fans, She Loves You was the one record that started it all. Who In Canada knew in 1963 that this group would evolve all the way through to the finale of The Long And Winding Road in 1970 ? Arguably, She Loves You was the most important Beatles single ever issued in Canada. But while the disc was originally released in mid-September 1963, it did nothing chart-wise for a staggering three months. Above - Paul White signed copy of 72125 in original 1963 RCA Victor record library sleeve. Above - B-side of Capitol 72125 in original 1963 RCA Victor record library sleeve. 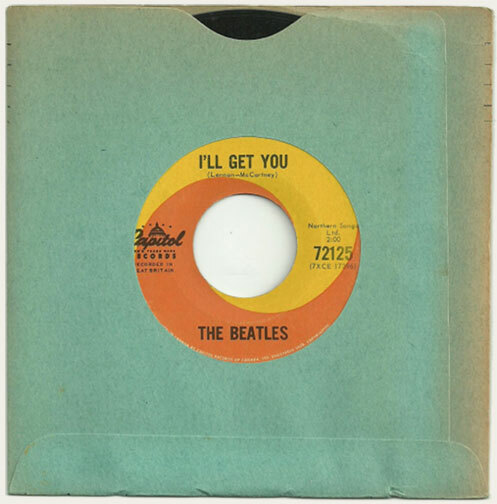 The original 45 that was issued in Canada was actually "dubbed" from a black-label Parlophone "factory sample" 45 sent over by EMI in England to Paul White at Capitol Records Of Canada in Toronto. RCA Victor studios on Mutual Street in Toronto did the dubbing at Capitol's request and RCA created a unique Canadian master. The initial batch of 1,000 copies were pressed in early to mid September 1963 at RCA Victor's pressing plant at Smiths Falls, Ontario. Approx. 200 of these records were sent as promotional copies to radio stations across Canada, with the idea that those targeted stations would play the 45 in order to generate local interest. According to Capitol's Paul White, there was very little interest in the 45 upon its initial release. The disc did not see much chart action until December 1963. 3. So where are the original 1963 copies? 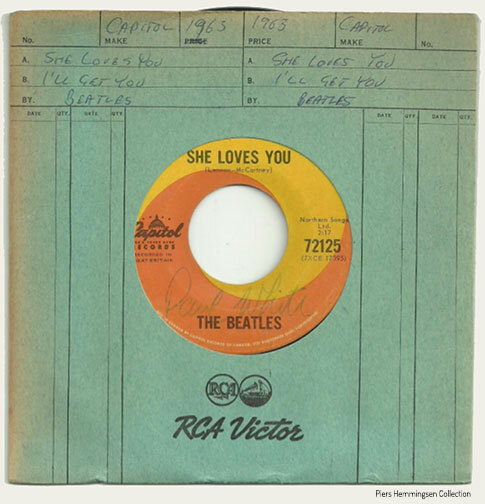 The Beatles' She Loves You 45 on Capitol did not chart in a major way until December 1963. After that, the disc was re-pressed to meet demand. For sleuths of the first batch of September 1963 pressings, these original "no dash" copies would have been shipped to stores in a black glossy stock Capitol sleeve. The later re-pressings of the disc (from December 1963 and onwards) would have been shipped to stores in a mat black stock Capitol sleeve. Both labels list Northern Songs Ltd. as the music publisher. Above - Images of the 7XCE17395 matrix run-outs with no dashes. Only 1000 copies were pressed. Most importantly, Capitol USA decided not to issue this Beatles 45 but it was issued by Swan Records out of Philadelphia. Capitol USA did not release any Beatles 45s until I Want To Hold Your Hand. Capitol 72125 was the first Beatles disc to hit the number one spot in Canada. It was this 45 that broke the Beatles in Canada. 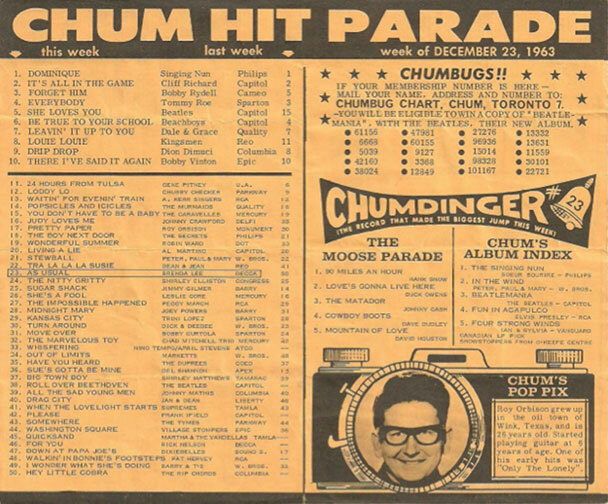 It went "Top 5" on Toronto's CHUM chart for December 23rd, 1963, and this was more than a month before they appeared for the first time on Ed Sullivan. The chart below shows that the Beatlemania Lp and the new Roll Over Beethoven 45 were also on the CHUM chart by this time. So a very happy 50th. Birthday to She Loves You on Capitol !